Of all the photos I have of Kelly from the 16 years she lived with me—and there were very, very many—this photo is my favorite, and can you believe she is 17 years old in this photo? Kelly never seemed to age all the years she lived with me. She loved the studio even from her first frightened days here, and it was her room of refuge until she adapted to living in a home with so many other cats in 1997. 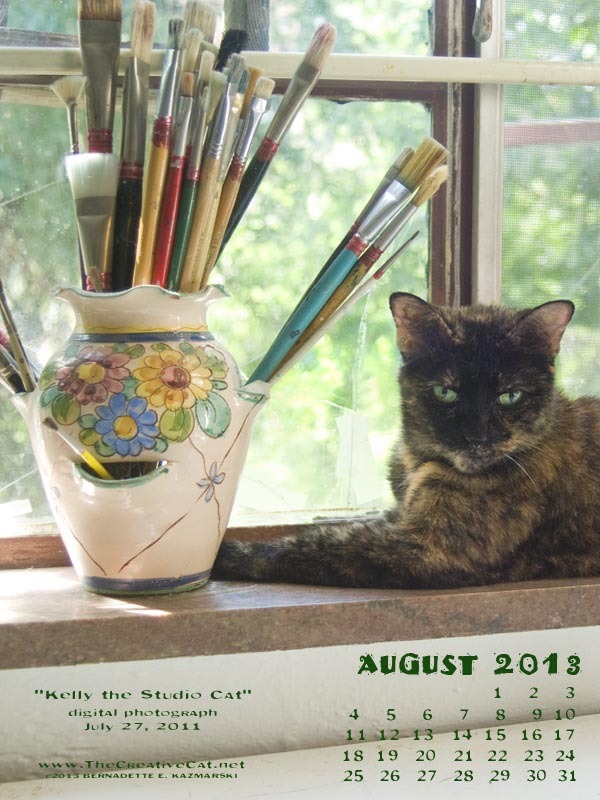 All through the years she enjoyed the windowsill, and after I “cleaned it up” in June 2011 she was a permanent resident of my studio, watching over my drafting table and easel as I worked. 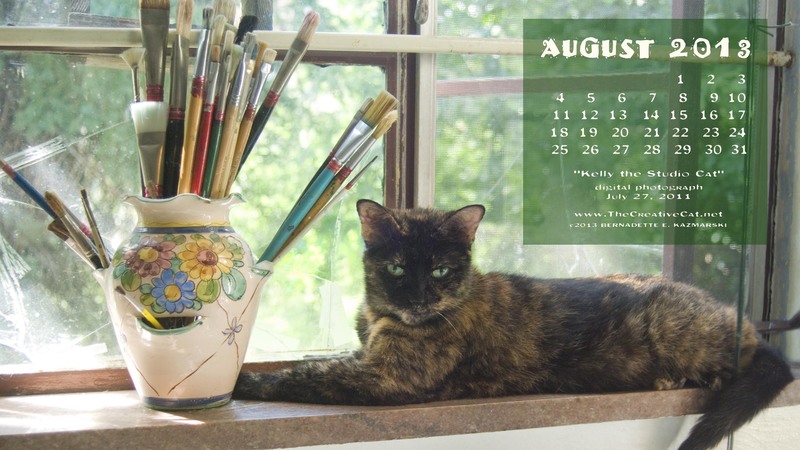 In this summer scene her eyes echo the green of the leaves in our maple tree, her orange and black tortie spots the bright sunspeckles and deep shadows. Though Kelly was excessively sweet and could be very silly she was typically very serious and reserved, and for me the whimsical flowers painted on the vase and my collection of old paintbrushes used mostly for decoration capture that fanciful side of her personality. Most of all, she is relaxed and happy. This photo has been my desktop image on my studio computer since last August because it’s like having Kelly here with me again. And it’s not only one of my favorite photos of Kelly, but for many reasons one of my favorite of all the photos I’ve ever taken. I’m remembering Kelly this month of August, a year after her passing, but not with sadness because she lived to be 19, and for the 16 years she was here with me we had much more to share than the sadness of her loss. Kelly walked a long and difficult path from fear to love, and each of her successes in confidence was an achievement to be celebrated. While I’d intended to do a painting of this photo from the time I’d taken it, a watercolor, when I actually sat down to study the image and plan my painting I ultimately decided against it. I usually decide to paint an image because there is something I can add to it in my style and medium of choice. The more I studied this image the more I thought the photo was a more appropriate—my skills weren’t going to add anything to what the image had to say. And of course, the day I’d taken this photo I’d also taken a number of others, and I’d published the photo below, which I also like because it’s a closeup and Kelly is looking at me. You can see this post here along with other photos of Kelly. 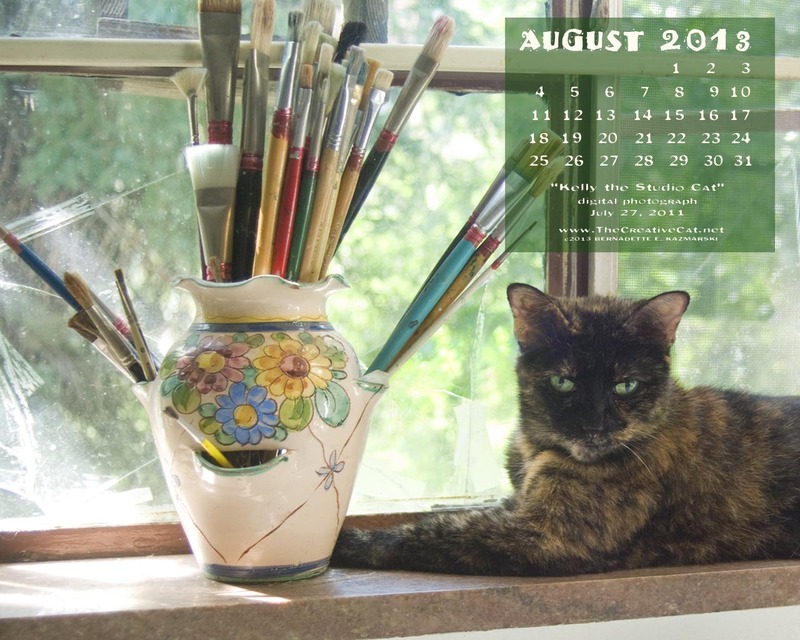 While I usually feature a painting in my monthly desktop calendars for a painting’s uniqueness, it’s really all about the image, and this image is what I want to share with you this month. I wrote up Kelly’s rescue story as I have many of my other cats’ stories, but the story turned into a surprising five part serial, and even that didn’t tell the whole thing. I decided as I wrote it that Kelly’s story was the story of many cats who’ve found themselves living on their own, living in shelters, uncertain of humans, and I decided I’d expand it into an illustrated book dedicated to Kelly and to the many other cats like her. Read about the book here. And for more of a dose of Kelly’s absolute sweetness, grab yourself a snack and get comfortable and click here to see more images and read more stories about her. I’ve worked this image into a desktop calendar for you to enjoy and use for the entire month. Looking at the downloads from previous months and averaging out which dimensions fit which devices, I have reduced the number of variations from 12 to three. It was very time-consuming to create all the variations with new devices arriving all the time, so I have one for horizontal monitors/screens, one for square monitors/screens, and one that should fit the dimensions of nearly all mobile devices. If these sizes don’t work for your device, please let me know—believe it or not, I don’t have any mobile device at all except for a TracPhone, though I do have three different sizes of desktop computers! ← Daily Photo: Last Day For the Petties, Thanks For Voting For Us! Pingback:The Creative Cat - Daily Sketch: Bird! She’s a beauty! And as always, thanks for the desktop calendar. Vicki, I’m so glad you like these–and if the three selections I’ve gone with don’t fit your computer, let me know. Ingrid, of course–it’s Kelly! My favorite memory of her. Yes, Maru, and she was very happy to be my studio kitty! Thank you, Carolyn–I love knowing she’s out there in the world, and quite far away considering where you are! Thanks, Tabbies–tell you human the book is in progress, but you’ll be sure to hear about it when it’s done.